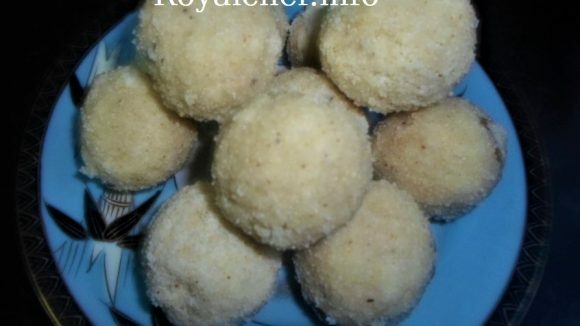 This is a Recipe for making at home sweet and delicious Fruit Juice Stall or Ice-cream Parlor Style Rose Mastani a most famous and popular Milkshake, which originated in the city of Pune. This tasty Milkshake is prepared using Red Rose Syrup, Vanilla Ice Cream and dry fruits. First soak the Sabja Seeds in ¼ cup of Water for about 10-15 minutes. In a Juicer add Milk and Red Rose Syrup and blend 3-4 times. 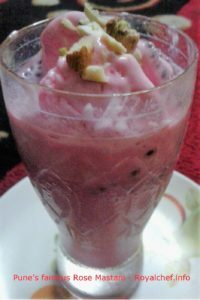 Take two decorative glasses and first add 1 tablespoon Rose Syrup and then add Milk, then add some soaked Sabja Seeds then again add Milk and then add the Ice Cubes and then the Ice Cream and Garnish with Dry fruits. Prepare both the glasses in the same manner. Keep the glasses in the refrigerator for 2 hours for cooling. Serve the Rose Mastani chilled. While preparing Ice Cream you can add 1 tablespoon Rose syrup instead of Vanilla Essence. Sabja Seeds can be bought in the u.s./online? Try searching for Basil Seeds, which is the English name of Sabja Seeds.